Just before the establishment of the School of Home Economics at Purdue University, Dean Mary L. Matthews had encouraged Laura Partch to form the Purdue University Nursery School,"in order to give practice for senior students taking the course in Child Care and Management." 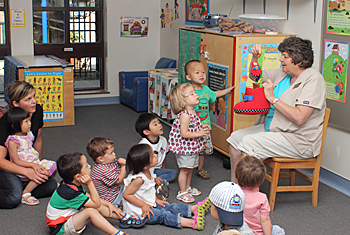 The nursery school, then, is older than both the Department of HDFS and the School of Home Economics. It was originally housed in Building Two (pipes across the ceiling, bare wooden floors and moveable "walls"), so named because it was the second building on campus. It was situated where the driveway to the Stone Hall parking lot now is located. Sixteen children came into the 1926 nursery school; by 1929 a well-known early childhood educator, Katherine Read, was added to the staff. 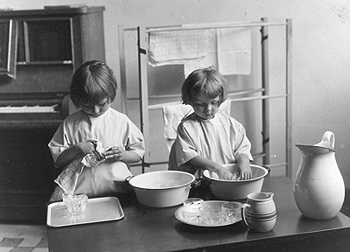 In 1930, the American Home Economics Association reorganized so as to have nine official professional departments, two of which were "family relations"and"child development." 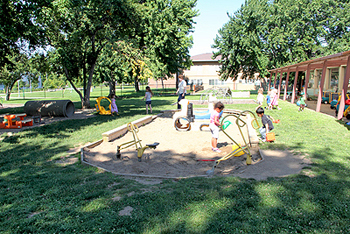 During this decade, the Purdue Department of Home Administration continued to increase its emphasis on child care, partly by adding coursework in this area. 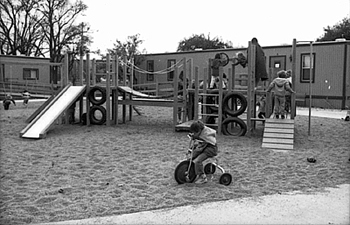 The nursery school emphasis was also increased: a playground was first used in the early 1930s, and by 1939 there were two nursery schools equipped to care for 30 children. Graduate assistants in the Department of Foods and Nutrition served as nursery school dietitions. 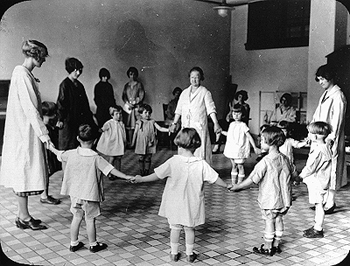 Marian Mattson, who had a Ph.D. from the Institute of Child Welfare, University of Minnesota, became Director of the Purdue Nursery School and taught child development courses. In 1939, Isabelle Diehl, who had been a war-time Army nurse and later received a Master's degree from Purdue, rejoined the Department of Family Life (renamed in 1946) and established innovative programs for infants and toddlers, involving their mothers and Purdue students. Caroline McCullough was hired to be Head teacher of the older nursery school children and arranged for family life students to get practice teaching in kindergartens of public schools. 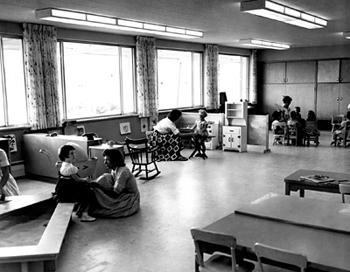 The Department established a cooperative nursery school for the children of professors and students, which later developed into the Nimitz Drive Nursery School, and a kindergarten was also established for the children of young faculty who lived in prefabricated housing. 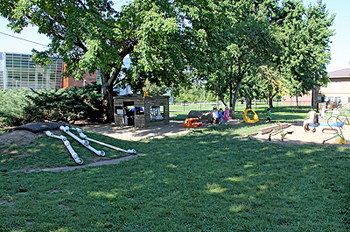 Two new afternoon cooperative play groups for students' children were also added to the Purdue Nursery School. In 1959, the Department of Child Development and Family Life (renamed in 1956) moved into its new home. It had two large child development labs (nursery schools) with an observation booth in each lab and a large playground. The Child Development Laboratories continued to be an important teaching, research and service instrument in the decade of the '70s. Directed by Flo Kerckhoff, they included an infant laboratory, a toddler lab, four pre-school labs, and a new family laboratory. 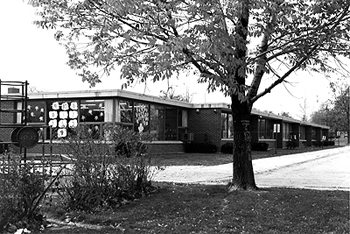 The Department's goal of constructing bridges with the larger community in the 1980s was partly realized through the establishment of a day care center, The Purdue Child Care Program, housed in several leased rooms of the Burtsfield Elementary School Building of West Lafayette. Directed by Elaine Dolch, the day-long childcare program grew from 12 children when it opened in August of 1983 to 73 children, with another 68 on the waiting list, in 1986. As the Purdue Child Care Program grew, it was moved onto the Purdue campus and into mobile classrooms that were located near the Purdue West Shopping Center. The Child Development Laboratory continued its program located in the CDFS building. 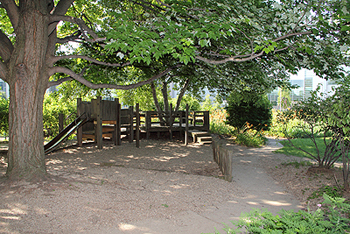 In 1980, new playground equipment was designed by Dr. Gregory M. Pierceall, Landscape Engineer with the Department of Horticulture, for the Child Development Laboratory. One of his classes helped design, erect and plant the play area. 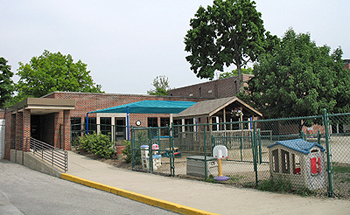 In 1994, the Purdue Child Care Program moved into the newly renovated Fowler Memorial House with larger classrooms and new playground equipment. 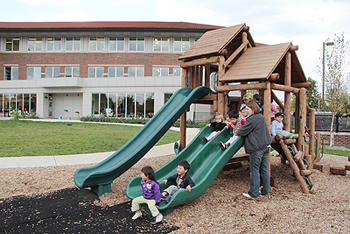 In 2006, PCCP was renamed the Ben and Maxine Miller Child Learning Center after longtime Purdue supporters. In the summer of 2011, the Bill and Sally Hanley Hall was completed adjacent to Fowler Memorial House and the two child care programs were combined and renamed the Ben and Maxine Miller Child Development Laboratory School. The merger of the two programs provides opportunities for one large group activity involving children from both locations. It also allows for more diverse experiences for the children by sharing play areas outdoors, participating together on field trips, and allowing visits to one another's classroom without crossing the street. Classroom teachers are able to meet together as a whole — sharing ideas, information, and resources with one another — making it easier to collaborate on projects that will benefit the children.